The basic elements of the chapel for funerary rituals are complemented with the life-sized replica of part of the chapel of Nakht and the restoration of a figure known as Iny using original components of the chapel. Unlike sepulchral chambers, the area of Egyptian tombs for funerary rituals was accessible to parents or persons responsible for making the offerings necessary to ensure the subsistence of the deceased. 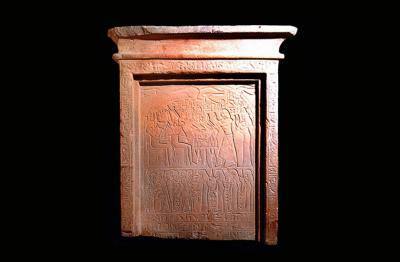 In the case of managed tombs and the tombs of certain high-ranking individuals, activities related to funerary rituals occurred in areas of great monumental importance, such as the High and Low Temples of the pyramid complexes (the Old and Middle Kingdoms) or the mortuary temples of the New Kingdom. For private tombs the area of worship is significantly smaller, either in chapels located within funeral structures (the Ancient Kingdom) or excavated in full or in part from rock (the Middle and New Kingdoms). Replacement statues, false door steles, offering tables and wall representations of all types are some of the items most commonly found in this area of worship. Chapel for the worship of Iny. The 6th Dynasty (the reigns of Pepi I, Merenra and Pepi II, 2289-2152 B.C.). The original elements that comprise this chapel have been brought together as a result of four separate acquisitions over time. Iny was an important person who served three different pharaohs (Pepi I, Merenra and Pepi II). He held honorific, religious and, above all, administrative and military titles in relation to its main role: the execution of expeditions to secure minerals. Iny led six commercial expeditions: four during the reign of Pepi I (in search of silver), one during the reign of Merenre (lapis lazuli, lead, wood and sefetj oil) and another at the start of the reign of Pepi II (silver and wood). The place names referred to as destinations (Biblos, Lebanon) constitute important evidence for learning about Egypt’s commercial ties with the Levant. 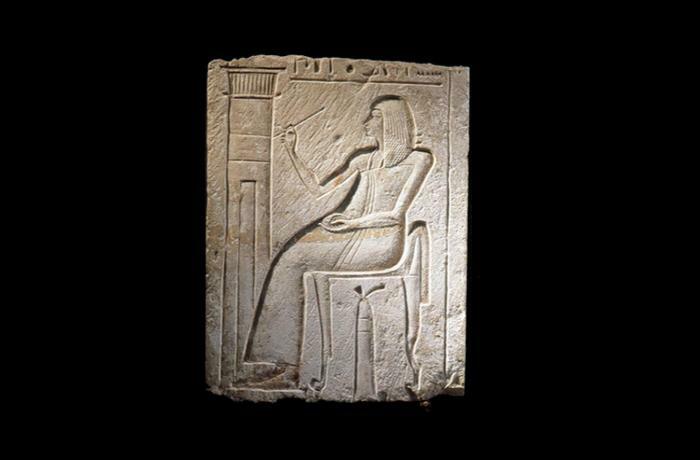 False door stele of the scribe Sebekemheb. Sandstone. The 38th Dynasty, reign of Amenofis III (1391-1353 B.C.). 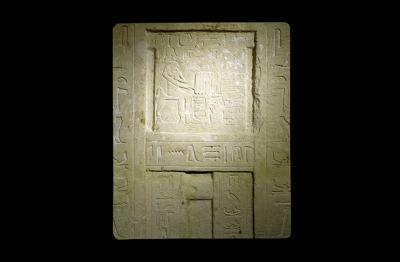 The false door stele was conceived as a pathway between the world of the living and the world of the dead. The eyes allow the dead to see what happens inside the offering chapel and, when necessary, can lead out from the concealed sepulchral area. The scenes from this piece show Sebekemheb with his wife before the gods Osiris and Anubis. Beaneath them, various family members provide offerings for the dead. Fragment of wall relief with a noble decorating their tomb. Limestone. 19th Dynasty (1307-1196 B.C.). From the Ancient Kingdom onwards, the walls of the chapels of worship featured painted representations or representations in relief. In this case, a person dressed in attire characteristic of the vizier is decorating what appears to be their tomb. In their left hand, they are holding something that is difficult to identify (a burnisher?) and, under the chair, there is what could be a container with papyrus inside. Offering table belonging to Inpu. Limestone. The New Kingdom (1550-1070 B.C.). 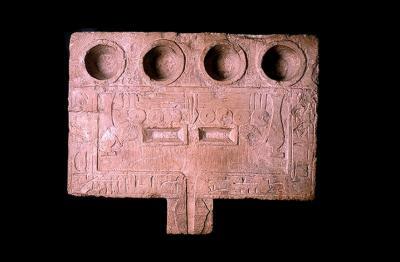 The offering table was placed in front of the false door stele so that the deceased could find the food necessary to live on in the Afterlife. Offerings were usually depicted on the surface.